According to legend, Mungo's mother, Theneva, was seduced by Owain mab Urien, King of Rheged and a figure of Arthurian legend. When her father, King Lleddun of Gododdin (present-day Lothian), discovered that she had become pregnant, he had her thrown from Traprain Law. She survived the fall and escaped across the River Forth to Culross, where she sought shelter in the community of Saint Serf, apostle to the Picts. After Theneva bore her son, Kentigern, Saint Serf adopted the child and raised him for the religious life. Serf also gave the boy the pet-name by which he is known in Scotland, Mungo, which means dear one in Brythonic Gaelic. Mungo, a contemporary of St. Columba, began his missionary work at the age of twenty-five along the River Clyde, where he built a church at the confluence of the river and the Moledinar Burn. He lived there in austerity for thirteen years before anti-Christian sentiment forced him to retire to Wales, where he remained until he was invited to return to Strathclyde by the new king. Mungo fixed his seat at Hoddom in Dumfriesshire while evangelizing the district of Galloway for many years before returning to his church at the Moledinar Burn, around which a community was quickly growing. The community became known as Clas-gu, or "dear family," and was the foundation of the city of Glasgow. Mungo became its first bishop. 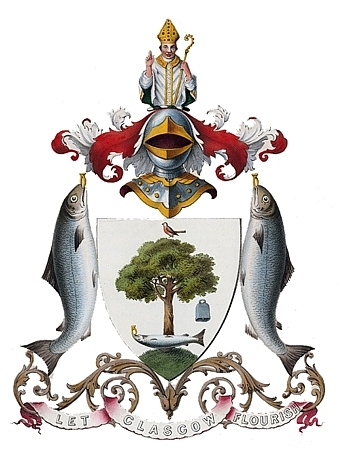 Glasgow's coat of arms incorporates a number of symbols and emblems associated with Mungo, the city's patron saint. The robin on the shield recalls a time from Mungo's boyhood when some of his fellow classmates at the monastery accidentally killed Saint Serf's pet and tried to blame it on him. Through fervent prayer, Mungo restored the bird to life. These same boys tried again to thwart Mungo when they caught him having fallen asleep while guarding the holy fire by putting out the flame. When Mungo awoke, he broke a branch from a hazel tree and prayed for it to catch fire so that he could relight the holy flame. This miracle is represented by the tree on the shield. Another image on the shield commemorates the bell Mungo brought back to Glasgow from a pilgrimage to Rome. The original bell was lost, however. Its replacement, made in 1641, is on display at the People's Palace Museum near Glasgow Green. The supporters, two salmons bearing gold rings, refer to the story of Queen Languoreth of Strathclyde. Her husband had given her a ring that she, in turn, gave to a knight with whom she was having an affair. The knight wore this token of affection on a chain around his neck, and the king saw it while they were on a hunting party. Humiliated and enraged, the king quietly removed the ring and threw it in the River Clyde. He then returned to his wife and threatened to have her put to death if she could not produce the ring he had given to her. Distraught, Languoreth confessed her sins to Mungo and begged his help. 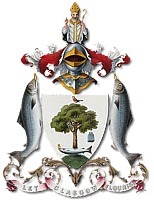 Mungo took the queen with him to fish in the River Clyde. He reached into the mouth of the first fish he caught and produced the ring for Languoreth, who was able to escape her husband's persecution. Glasgow takes its motto, "Let Glasgow flourish," from Saint Mungo's call, "Let Glasgow flourish by the preaching of His word and the praising of His name."